Inspired by the Twilight Trilogy, Amber Eyes amazes you with its vibrant orange and brilliant white Lilies. 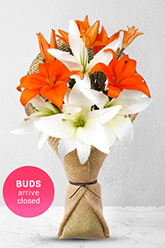 Friends and family alike will enjoy this fantasy stirring flower arrangement.Lilies may be sent closed/partially closed in order to prevent damage and to last longer Vase not included however to better personalise your gift, we recommend adding a Premium Vase to accompany these lovely Lilies. I live in Perth Scotland, and have just lost my wife in February. Her Grandad then lost his battle with cancer a couple of weeks before Grandma's Birthday. I managed with your assistance to get flowers to my Grandma for her birthday in under 24 hours notice. something that cheered her up after all that has happened this year and helped me forge a stronger relationship with new extended family. Thank you all for your hard work. The online site easy to navigate. Although a small hiccup with the delivery my daughter said beautifully presented. Excellent service. Arrived on Mother's Day. Perfect present. Thankyou. A bit disapointed that we placed the order at 5am Saturday your time thinking it would be delivered on the Saturday but then suprised you delivered it on August Bank Holiday Monday.